Ole and Lena were sitting down to their usual morning cup of coffee, listening to the weather report coming over the radio. "There will be 3 to 5 inches of snow today, and a snow emergency has been declared," the weather report said. "You must park your cars on the odd numbered side of the streets." Ole says "Jeez, okay," and gets up from his coffee. The next day they're sitting down with their morning cups of coffee and the weather forecast declares "There will be 2 to 4 inches of snow today, and a snow emergency has been declared. You must park your cars on the even numbered side of the streets." Again, Ole says "Jeez, okay," and gets up from his coffee. Two days later, again they're sitting down with their cups of coffee and the weather forecast says, "There will be 6 to 9 inches of snow today, and a snow emergency has been declared. 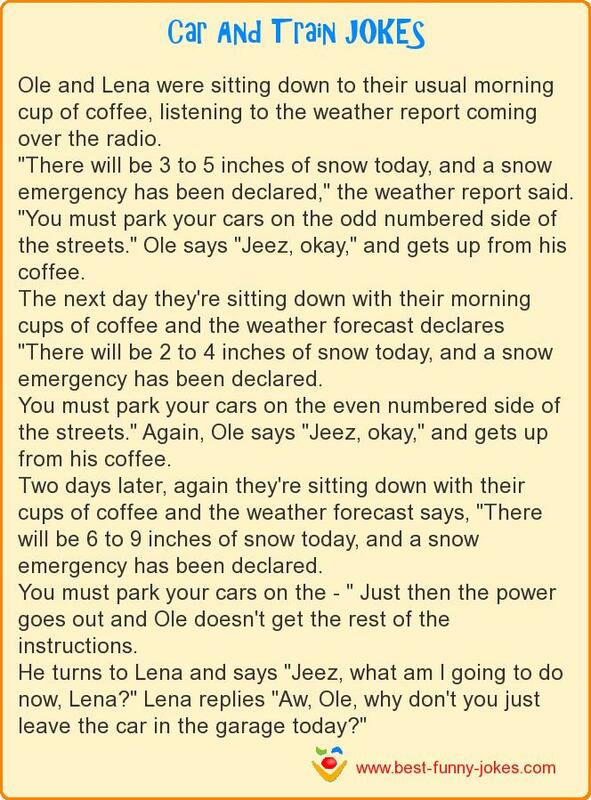 You must park your cars on the - " Just then the power goes out and Ole doesn't get the rest of the instructions. He turns to Lena and says "Jeez, what am I going to do now, Lena?" Lena replies "Aw, Ole, why don't you just leave the car in the garage today?"